Every year SSC (Staff Selection Commission) releases the vacancies for CPO (Central Police Organisation) to recruit liable and suitable candidates. 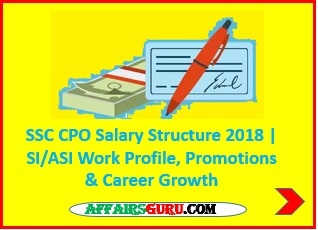 SSC CPO (Staff Selection Commission Central Police Organisation) includes the posts of SI (Sub Inspector) in Delhi Police, SI (Sub Inspector) in CAPFs (Central Armed Police Forces) and ASI (Assistant Sub Inspector) in CISF (Central Industrial Security Force). SSC CPO has released approximately 1223 vacancies to be filled through the recruitment drive of 2018-19 year. CAPF is a Paramilitary Force which is come under Union Home Ministry. It is not directly a wing of the Military. The CAPF includes the following below posts. It is structurally defined as below in the table. The post code (preference for post as indicated in the application form) for below post is A, B, C, D, E, F, G respectively. Recruitment is not only for Delhi but for whole country. Delhi Police come under home minister. India’ s first line of defence. This is also an important force. It prevents cross-border crimes, smuggling and anti-national activities and illegal immigration. ASI is the backbone of the force as they play the role of moderator between the team in the field and the control room. CISF is no longer a PSU-centric organisation. Power of Seizure – Seize anything illegal and take suspect into the custody. After Clearing SSC CPO Exam, you will be appointed in one of the post and get the regular good salary. Salary of SSC CPO SI in CAPF is also same as SI in Delhi. As you all know that salary of all the government employees has been increased after the 7th Pay Commission announced in country. After completion of training, SSC CPO Salary depends on the location where the SI and ASI posted. As we all know the promotion is a main key to our career growth, every person wants to be up to the higher level for more respectable position. So all aspirants desires to know the promotion level for career growth in the SSC CPO. Most of the candidates applies the application form after seeing own capability and growth in promotion. Promotions depends on the career records and performance of the person. Selected Candidate will get regular promotion after joining over the period. It is very rare that person can be promoted to the rank of Additional DCP but there are some instances to achieve this also.There are number of factors on which the promotion depends like number of vacancies, your work profile. Promotion of SI in CAPF has the same criteria as for the BSF. In BSF, there are promotion examination that you need to clear to get the promotion. But the chances of promotion are few as the promotional exercises are carried out on the basis of Zonal Security. So mostly it takes 7-8 years for the first promotion. Departmental exams and seniority factor comes into play for promotion. Candidate can also get the promotion Out-Of-Turn(OTP) if he/she has performed very well like extraordinary activities – catching of terrorists, killing of naxal, busting of gangs of criminals, tackle the unprecedented situation like encounters, seizing of drugs, IPL Betting Culprits etc. Departmental Promotional Committees takes the decision of a particular person depends on the records of history and achievement taken by him/her. Pay Scale : The pay scale is a platform that determines the salary or wages of an employee. There are certain factors on which pay scale of employees depends. The level of employment in terms of responsibilities, seniority, rank or status, the difficulty of the specific work performed. Pay scale of an employee is decided by an employer depending on above factors. Basic pay is a fixed amount of money paid to an employee by an employer in return of work performed. It varies on the basis of job profile. HRA : House Rent Allowances (HRA) is the reimbursement for employees which is given to ease the stay at the place of posting. If an employee uses the facility of the house on lease or leased flats from the employers, then that employee can not avail himself/ herself this allowance (HRA). NPS : National Pension Scheme (NPS) is a government-backed voluntary saving scheme that aimed to introduce saving habits for retirement amongst the citizens. This is designed to encourage systematic saving during the employee’s working period with an aim to offer old-age income or fixed retirement income to all the citizens of India. CGEGIS : Central Government Employee Group Insurance Scheme (CGEGIS) came into force on 1st Jan 1982. This scheme provides for two benefits. (ii) second one is lump sum payment to afford their life resources on retirement. All the employees who had entered Central Government Service after 1st November 1980 will be compulsorily covered under the scheme from the date it came into force i.e. from 1st Jan 1982. CGHS : Central Government Health Scheme (CGHS) was started under the Indian Ministry of Health and Family Welfare in 1954 with the objective of providing comprehensive medical care facilities to Central Government employees, pensioners and their dependants residing in CGHS covered sites. The cities which are not categorized under X and Y category falls under Z category. If you have still any doubt, comment below in the box. We will get back to you soon with response.